The Battle of Olympus is a side-scrolling action-adventure game for the NES developed by Infinity. It was published in 1988 by Imagineer in Japan for the Famicom and was titled Oryunposu no Tatakai: Ai no Densetsu (オリュンポスの戦い 愛の伝説, The Olympus Fight: The Legend of Love?). The North American and European versions were released for the NES in 1989 and 1991 by Brøderbund and by Nintendo respectively. There's also a 1993 Game Boy port of the same game that was developed by Radical Entertainment and published by Imagineer exclusively in Europe. 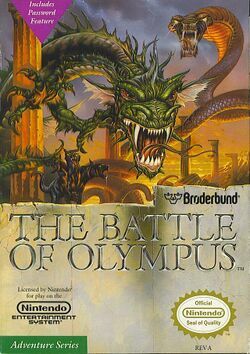 Similar in style to Zelda II: The Adventure of Link, The Battle of Olympus takes place in ancient Greece which is being terrorized by Hades, the dark ruler of the underworld. The pretext of Orpheus's quest is the story of Orpheus and Eurydice. Elements of the quest are drawn from the stories of Heracles and Perseus. Many characters, enemies, locations, and items are also based on Greek mythology. The player starts off with a basic wooden club. As the game progresses, players must find various forms of upgraded weaponry in order to defeat all of the mythological creatures Orpheus encounters, such as the Taurus, Centaur, and Cyclops. He will fight his way deep into the underworld, fight and defeat Hades, and finally save Helene. He will acquire several items depicted in the Greek mythology, such as the Harp of Apollo, the Sword of Hephaestus, the Staff of Prometheus and the Sandals of Hermes. In ancient Greece, there lived two lovers, Orpheus and Helene. One day, Helene is poisoned by a snake and dies. Orpheus learns that Helene was actually taken by Hades, god of the underworld, to become his bride. Upon hearing this, Orpheus begins his journey to save Helene. During this adventure, Orpheus will need to meet the Greek gods and gain their favor. Starting with Zeus, the leader of the Olympian gods, who encourages the other gods to grant Orpheus powers. These powers are in the form of a weapon, a shield, and other special equipment. Among them a harp, which summons Pegasus to carry Orpheus to far locations. This page was last edited on 28 July 2012, at 03:19.